What makes a great leader? It's a question that has been tackled by thousands. In fact, there are literally tens of thousands of leadership studies, theories, frameworks, models, and recommended best practices. But where are the clear, simple answers we need for our daily work lives? Are there any? 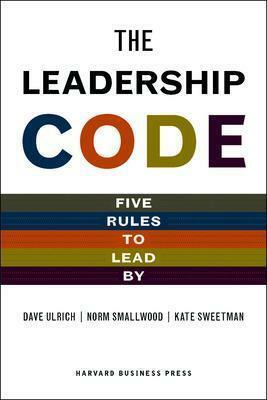 Dave Ulrich, Norm Smallwood, and Kate Sweetman set out to answer these questions--to crack the code of leadership. Drawing on decades of research experience, the authors conducted extensive interviews with a variety of respected CEOs, academics, experienced executives, and seasoned consultants--and heard the same five essentials repeated again and again. These five rules became The Leadership Code. In The Leadership Code, the authors break down great leadership into day-to-day actions, so that you know what to do Monday morning. Crack the leadership code--and take your leadership to the next level. Dave Ulrich is Professor of Business at the University of Michigan and a partner at The RBL Group. He has published fifteen books and has worked with over half of the Fortune 200. Last year, Fast Company named him as one of the ten most innovative and creative business management thinkers. Norm Smallwood is cofounder of The RBL Group and coauthor of five books, including Results-Based Leadership. He is also on the faculty of the Executive Education Center at the University of Michigan Business School. Kate Sweetman is leadership development consultant and a former editor at Harvard Business Review.